Is there anything less attractive than a monolithic slab of gray concrete? 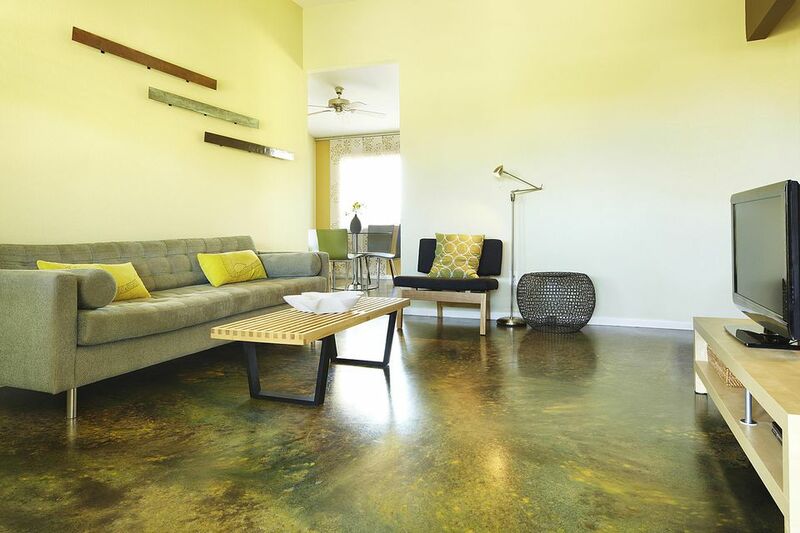 Rather than going to extremes such as breaking up the concrete or adding another floor covering on top, there are a few things you can do to enliven concrete. One method is stamped concrete. But stamped concrete only affects pattern and texture, not color. Staining imbues your concrete with a huge variety of colors, permanently changing its appearance. Staining Is Not Painting. Big Difference. It is possible to paint concrete. But this is an entirely different process, as painting puts down a very thin, 3 to 4 mils (.005") thick layer on top of the concrete. Except for some pigment that might seep into the pores of the concrete, it all stays on top. By contrast, stain soaks deep into the concrete. But it's not like coffee staining a rug. Concrete stain is actually a chemical reaction between the acid stain and the cement within the concrete mix. Concrete is made of both aggregate (rocks) and the binding cement. Because the stain works through a chemical reaction between the stain and cement, the aggregate will not stain. Concrete stain kits are easily available at your local hardware store or online. These kits contain everything you need: the stain, sealer, gloves, instructions. Keep in mind, though, that they may not cover a lot of square footage: perhaps as little as 200-400 square feet. Before staining a floor that you will be seeing and using a lot, first experiment with a little-used section of patio or even the concrete pad underneath your AC unit--before moving to the bigger areas such as basement flooring, driveways, or front patios. Concrete staining is not the same as adding pigment to wet, uncured concrete. The process is performed on cured, hardened concrete, and it can be done by the homeowner. Cleaning: You'll want to use an organic degreaser at medium strength. Note that because this is a chemical reaction, surfaces previously treated with muriatic acid or otherwise acid-etched cannot be stained. Imperfections in the concrete (that is, the other kind of "stains") will show through. Concrete stain is not a cover-all. Sanding/Scuffing: You may need to lightly sand down the concrete to open up the surface. Application: Concrete stain can be applied in many ways (mops, brushes, rollers), but experts recommend spraying on with an ordinary sprayer such as you might use for herbicides. This provides for a wider, smoother broadcast of the concrete stain. The stain can be diluted with water, which allows for a lighter application of stain. But if too much water is added, the chemical reaction with the cement will not take place. Waiting: What you see at first is not the end color. It takes up to 8 hours for the chemical reaction to take place. Don't walk on the concrete stain because your footprints may end up permanently on your concrete.